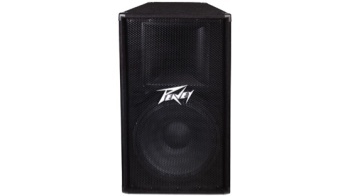 The PV(r) 115 is Peavey's most affordable two-way speaker cabinet with a single 15 inch woofer. This trapezoidal enclosure is capable of handling 400 watts program and 800 watts of peak power. Working pros will appreciate the built-in tweeter protection, heavy-duty crossover and molded-in pole mounts. Features include a 15 inch premium woofer with 2 3/8 inch voice spindle, an RX14(tm) compression driver with a 1.4 inch titanium diaphragm, 1 inch exit through a 90Â° x 40Â° constant directivity horn and heavy-duty metal grille.